Top Notch Material: Pearls by Laurel is the Perfect Mother's Day or Christmas Gift! Pearls by Laurel is the Perfect Mother's Day or Christmas Gift! If you know me, you know two things. #1 I love beauty products and jewelry and #2, I love customizable stuff! You know, books, jewelry...anything that we can put our own touch on it, I want it! Lucky me, I was recently contacted to review a beautiful Mother's Bracelet from Pearls by Laurel! Where you choose one birthstone or six, the cost is the same, only $29.95!! It is a classy reminder of your children when you wear it! I am not a huge fan of some of the gaudy "mothers" jewelry pieces I have seen before, but Pearls by Laurel is anything but that! It is so timeless and can be dressed up or down. I've worn it to work, church, and out shopping and it looks great in jeans, dresses and scrubs!! There are three sizes you can chose the small, medium or large. I went with medium since it fits most women, and it is a bit big! Next time I order a bracelet I will definitely order the small. I will be ordering another anyway, since immediately after ordering this bracelet I got a positive pregnancy test! This time next year, I will need a bracelet with three little pearl additions!! The quality is amazing! 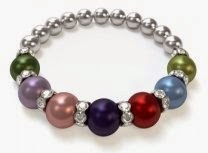 Each Birth "pearl" is followed by a rhinestone spacer that adds a touch of bling to the bracelet. I think this makes a beautiful Mother's Day gift, Baby Shower Gift or even a Christmas gift!! What Mother does not like to show her pride of her beautiful children by wearing jewelry that reminds her of them? This Mothers Bracelet is an elegant reminder of the priceless treasures in a woman's life. The birthstone months are represented using Genuine Swarovski Pearls. This bracelet is the perfect gift or keepsake for any mother, grandmother, or daughter. This bracelet features only the finest materials, including elegant Swarovski pearls, Czech crystal rondelles, and genuine silver components. It is strung on a durable, stretchy cord which allows it to slide comfortably over the hand. I am so in love with my bracelet, and at this price, it is the perfect gift for any proud mama in your life!! You can follow Pearls by Laurel on Facebook to stay up to date on the latest products!